This summer, as the Keystone intern at Old Economy Village, Hilary Lewis worked closely with curator and acting site administrator Sarah Buffington. Hilary shares her perspective with us as a graduate student of Public History at the Indiana University of Pennsylvania. History blankets the state of Pennsylvania, a state with so many stories to share. This summer I discovered the hidden treasure of our state, Old Economy Village of Ambridge, Pennsylvania. It is a historical site and museum so rich with history but so ridden with budget cuts. Old Economy is a fabulous example of how history stays alive even during these times of economic austerity. With our nationwide struggle to balance budgets, many fields across the board have been hit hard, and Public History is no exception. Yet even though these budget cuts have been coming for years now, they have managed to persevere and keep that history alive. The Harmony Society was a unique part of Pennsylvania’s history and could easily be lost if not for Old Economy Village. They manage an extensive site with a trove of artifacts and only a handful of employees. How do they survive, some might ask? I have seen Old Economy at work, and I can say that they persist because of passion and central goal. The individuals I worked with this summer have an unexplainable love for what they do and where they work, and even though money and resources are tight they succeed by working together. They taught me how a historical site can push through difficult times. I witnessed a selflessness while I was at Old Economy Village that showed me how they reach their goal of bringing the Harmonist past to the present. My major project this summer was to put together an exhibit for the 150th Anniversary of the Civil War. The theme of the exhibit was a celebration of the efforts of Beaver County, Pennsylvania, and the Harmony Society’s involvement. This project was new and exciting for me. I was given the opportunity to research, write and mount a complete exhibit. The Civil War is a large area of study that many people are interested in and it was no easy task to determine what we should display. We had to figure out what areas we wanted to convey and how best to do it. With so much to do in so little time, we felt like it might never get done. Regardless, we kept on working and when push came to shove, everyone pitched in to help make our exhibit a reality. Some students may go to an internship and never get dirty, never feel the pressure, never sweat, and never taste the fruits of their labor. This was not the case at Old Economy. Every day brought a new experience and a helpful lesson. My major project may have been creating a Civil War exhibit, but I was able to participate in a little bit of everything. You always had to be prepared to get a little dusty while working on the site. Some afternoons you might have to help in the gardens, other days you might be cleaning collections or working in the archives, and many times you might be lending a hand setting up for a special site event for the community. Even in times of economic struggle and stress, history never halts. Historical sites like Old Economy Village keep history alive for the public by working tirelessly to make sure that the past is not lost and the doors are kept open into the future, and they do so by working together, one exhibit at a time. Who says nobody’s interested in history anymore? Probably no one who bothers to read Trailheads, but allow me a rhetorical question. Sites on the Trails of History are always in the news (as are other historic sites and museums), and I’ve selected 3 recent stories to highlight this week. 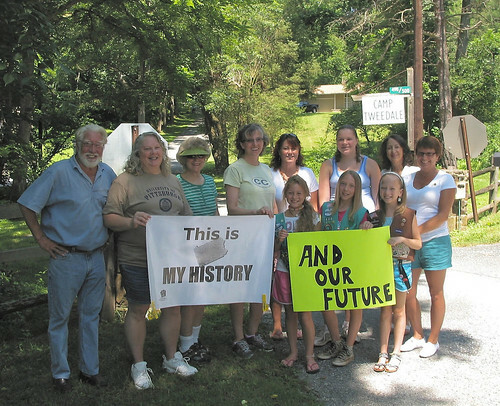 In 2009, the world celebrated the 150th anniversary of the first successful well drilled for oil, which is commemorated at Drake Well Museum, one of the sites on the Pennsylvania Trails of History. This past week, the McClintock Well #1 celebrated its 150th birthday, surrounded by friends and well-wishers (I did actually write that without intending the pun—I swear—but now that I see it, I’m keeping it—sorry). McClintock has been producing oil continuously since 1861 and has belonged to the Commonwealth since 2000, when it was donated as an icon of the oil industry. It produces roughly 40 barrels a year, some of which is bottled for sale at Drake Well Museum. You can see local tv coverage here. The Hazleton Standard Speaker featured an article last week about the successful completion (or soon-to-be completion) of a major restoration project at Eckley Miners’ Village. Ten historic worker houses have had asbestos removed, chimneys and foundations stabilized, and new (but historically accurate) siding installed. Guest blogger Bob Quarteroni reported on the project on Trailheads last January, and I just found (through a link on Eckley’s website) a news report from WNEP-TV 16 that I think is worth sharing. On August 8, the Philadelphia Inquirer website featured a quick video interview (by Ginny Smith) with historian Irwin Richman, talking about the traditional German four-square gardens at Landis Valley Village & Farm Museum. Dr. Richman has written and lectured extensively on Pennsylvania German gardens (and many other topics of interest); he explains in the interview that the religion of the gardener helped determine the content of the garden—which links nicely to PHMC’s 2011 theme on religious diversity (see posts here and here). PHMC has launched a new photo campaign called “This is My History.” You can take part by submitting photos of historic buildings, landscapes, streetscapes, archaeological excavations (to name a few) in your community. Photos submitted by Oct. 31 will be considered for inclusion in the Statewide Historic Preservation Plan for 2012-2017. But even the photos not selected for the plan (and those submitted by the final deadline of Dec. 31) will be available for history and preservation-minded folks to enjoy via PHMC’s Flickr account (that’s where you submit your photos). More information is available here, including a nifty (did I say nifty?) sign you can include in your photos. Staff and volunteers at Somerset Historical Center are getting ready for a visit from the Civil War 150 Road Show, August 26-28. They opened a temporary exhibit earlier this summer and hosted a review of military and civilian clothing from the Civil War era. Now they’re (that’s Historical & Genealogical Society of Somerset County volunteers Carl Kahl, Chris Zanoni, and Gary Burkett) hoisting the banners to get ready for a weekend of encampments, programs, and the traveling exhibit. 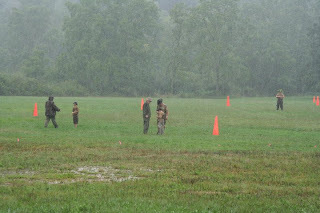 Pennsylvania Military Museum has posted photos on their Facebook page of two recent events--Vietnam Revisited and Boot Camp for Kids (a new program this year where kids got a taste of basic training and military service from people who’ve lived it). 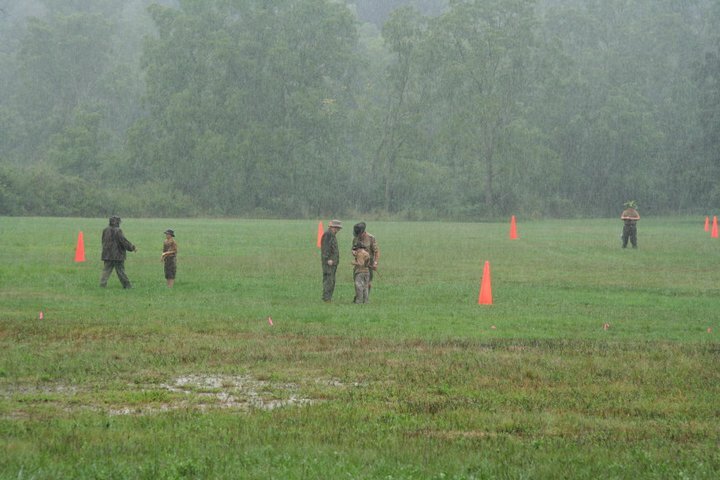 I had to pick one boot camp photo to share here (notice the heavy downpour? ), but if you visit their page, or this article in the Centre Daily Times, you’ll see lots more. Our guest blogger this week is Lynn Rice, a Keystone Intern in the Education and Outreach Department at the State Museum of Pennsylvania. A graduate student in public history at Indiana University of Pennsylvania, Lynn described her internship to me as follows: "This department works hard to keep the museum doors open from day to day by teaching classes, escorting school groups and working with the community and local organizations to make the museum a central space for functions. Working here has opened my eyes to what a museum can do for a community." Thanks, Lynn, for your work, being willing to blog about your experience, and the photos (the captions are mine). Though not everyone in this department would consider themselves a public historian, they certainly reach the public. Mostly when I ask the question “Do you consider yourself a public historian?” many pause, give me a puzzled look and say, “I guess in some ways.” Due to the newness of this sect in the history field, many historians who fall under other titles do not think of themselves as public historians. In reality most historians who work at all these sites, parks and museums are public historians in some sense. Public historians come in many shapes and sizes. From the lighting coordinator for exhibits, school group coordinators to the museum director, public historians are found on all levels. Interning with museum educators this summer has been rewarding. These people work daily with the public making Pennsylvania history interesting and available. In my definition and those classes I pay for, that is a public historian. My project this summer has been to put together IdeaZone. This is an interactive space for families to explore and learn about this year’s theme, the arts in Pennsylvania. In some ways, this project was a test of my abilities, in that I have almost no education background, and in other ways this project felt like the back of my hand, as I have much performing arts experience. The point of the theme is to bring light to the idea that the arts are not just paint to canvas, but stretch across mind and stage. Many of the arts stretch to other fields like architecture and communications. In many ways IdeaZone and concepts like IdeaZone touch on several forms of public history. This internship has helped me see the connection between what I study in class and this practical museum work experience. A main concept I have taken from my graduate studies so far is “space for dialogue.” It encompasses the idea of an exhibit or room where people can have open conversation with the public historian and each other to gather their own individual experience. In IdeaZone people can do just that. With my time working in IdeaZone, I see a three-fold public history experience. First, creating the exhibit takes an understanding of the audience, a focus of content and creativity of the historian. Second, in the space the audience has a place they feel the interaction with the content, whether it be hands-on artifacts or activities for families. And third, by being in the exhibit to direct it, I act as the go-between of the public and the exhibit. This is in an attempt to pinpoint what the audience wants to take away from the exhibit. In many ways, IdeaZone is the ultimate public history experience for both the intern and the families. Public historians can come in all shapes and sizes, even in the simplest sense. Overall, the public historian comes alive with the warm summer months. Coming out of ivory-tower hibernation, the public historian can work in creative and mysterious ways to bring history to these summer visitors.